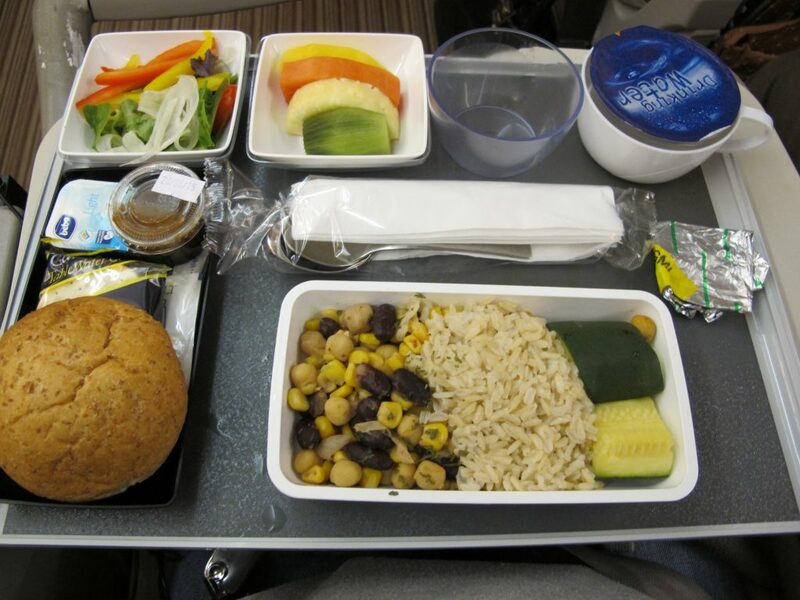 Vegan meals as the default airplane meal: who will make it happen? Here I want to suggest one concrete space where changing the default option could be implemented: airplanes. When I want a vegan meal on a flight, I need to remember to specify that during booking, find out where on the site I can request it, or contact a travel agent. It’s not the default option, and it’s a bit of a hassle. And requesting my special meal does not even guarantee that I will get it (as happened on my last flight – I always pack my own meal to be sure). Why not make vegan meals the default meals on airplanes? it simplifies things: the number of special meals is greatly reduced. 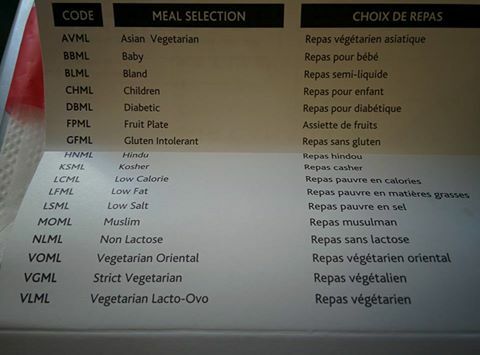 Look at this list of options that came with the special meal I had recently. Many of the allergies and preferences (religious or not) would be covered by a vegan meal (though we should be wary of lumping them all together in order to not end up with an entirely tasteless vegan option). it’s better for food safety. Plant based meals don’t pose the same health risks as meat meals, for instance, in case of a refrigeration problem. And on top of that, the first airline to do it could get international media attention. It would also set an example for other companies to follow and could be an important precedent. Ideally, the meals would be so good that no one complains, and the airline actually gets famous for its meals. As the acceptance of vegan meals grows, and as businesses and governments get more sensitive to climate change and health issues, I believe a vegan meal as the default option on airplanes can be realistic. Any individual or organization ready to campaign for this? Spread the message! Another idea I just finished an inquiry of……ABC bakers does over half of the Girl Scout Cookies Vegan and serves many Girl Scout Councils across the Country….another baker does only the Thin Mints Vegan. Approach your GS Council, esp. if you have a daughter involved and request ABC Bakers! I’d like to add that it might make sense not to call the vegan default option “vegan”, though. 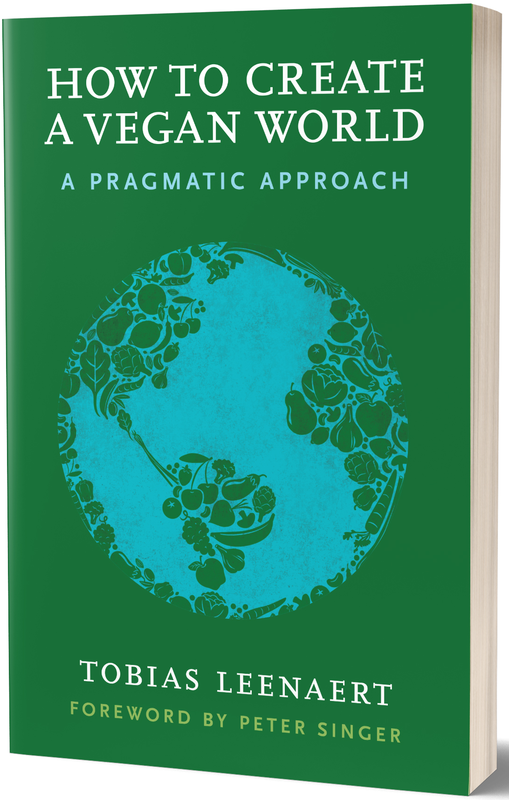 Given that the airline industry is under fire for their environmental record, presenting the vegan default as “eco-friendly” or “zero-footprint” or whatever instead might lead to more people opting for it and less resistance in terms of “too extreme” or “too radical”. How about calling it “plant-based”? It’s a fairly popular term, and the airline could specify this means no meat, dairy, or eggs are included in the meal. It’s been years since I’ve been on a flight with meal service (although earlier this year when I flew on Virgin, you could buy a meal, but their plant-based options were sadly lacking). I try to scrounge something at the airport or bring along my own snacks when I fly. The problem is that to “satisfy” most vegans, you’d end up with something spectacularly bad. With Girl Scout cookies, they are tasty and indistinguishable from the non-vegan option. Every vegan meal I’ve had on a plane has been something your normal omnivore would loathe. hmm, that’s not my experience on airplanes. but you’re right that the meal should not be horrible of course, that would be counterproductive. Definitely something to follow up on, Tobias. Are you going to pitch this idea yourself? You’ll need a creative team. As long as it’s vegan, I’m with you. I always tell people even if they aren’t vegan, they should sign up for the vegan meals because they ALWAYS taste better. Seriously, I’ve flown on United, Turkish Airlines, Korean Air, Brusseles Air… the vegan/special request item is ALWAYS better. That said I feel like starting with cookies might be less intrusive. You can’t *really* boycott girl scout cookies like you can an airline. There’s no competitor for GSC, whereas you can switch airlines, and people would feel guilty slamming the door on those adorable girls. Certainly never meant as an ‘either/or’, but having just read a Peta email about one Baker being more Vegan than the other and it seemed that it wasn’t related to area of Country but rather which Baker a particular GSCouncil used. Seeing that ‘my’ council used the ‘wrong’ one if I wanted to buy more than Thin Mints it was a ‘no brainer’, but also an EASY thing for us ALL to do in showing ‘we’ Vegans are a growing lobby to consider in $$$ decisions! Such a great idea! How do we get started? It’s important to inform people who are reading this post that plant based meals are just as, if not more, susceptible to food safety issues when there is a refrigeration problem. Food safety is extremely important in the airline catering industry and the stringent measures taken to protect food are not limited to meats and cheeses, they include fruits and vegetables, cooked, frozen, or refrigerated. I would argue that plant based foods are even more susceptible to food safety issues when there is a refrigeration problem because post-processing, they may or may not be cooked. Among the major food-borne illnesses that have touched Americans in the past decade we can definitely see pathogen contamination of meat. But ignoring pathogen contamination of cut fruit, spinach, nut butters, flour, romaine lettuce, bagged lettuce, hazelnuts, rice, papayas, tomatoes, strawberries, alfalfa sprouts, clover sprouts, bean sprouts and did I mention sprouts… well, this type of omission would lend people a false sense of safety when it comes to fruits and vegetables. ANY food sitting outside of refrigeration in the temperature danger zone, 40F to 140F, are doubling their bacteria counts every 20 minutes. If the ingredients you’re working with are going directly into a cold dish, there is no chance of a kill step to prevent these bacteria from entering your GI tract and wreaking havoc on your body. In some bacteria, Bacillus cereus i.e. the “fried rice bacteria”, the toxins produced cannot be eliminated through heating at all. Luckily, there isn’t a caterer on this planet that wants to give 200+ passengers, vegan or not, diarrhea on an airplane with only 4 bathrooms. Food safety measures for airline catering include and always will include controls to maintain proper time and temperature of ALL raw ingredients received in any form, stored in any form, prepared in any form, and delivered in any form. Amen to that.